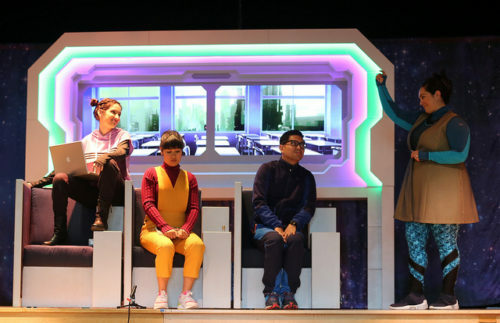 L-R: Amanda Arbués-Gille, Ciarlene Coleman, Nicole Marie McEntee and Wilfred Paloma in La Jolla Playhouse’s world-premiere of Light Years Away. Photo: Jamie Lytle. LA JOLLA–La Jolla Playhouse announces the cast and creative team for its 2019 Performance Outreach Program (POP) Tour production, “Light Years Away,” by Laura Schellhardt, directed by Playhouse Artistic Programs Manager Jacole Kitchen. The production will tour schools throughout San Diego County through March 30. Commissioned by the Playhouse, the world-premiere play for young audiences will also have four public performances on March 9 and 10 at 1p.m. and 3 p.m. at the Playhouse. The cast features Amanda Arbués-Gille (POP Tour production of #SuperShinySara) as Carina, Ciarlene Coleman as Ida, Nicole Marie McEntee as Cal and Wilfred Paloma as Leo. The creative team includes Laura Schellhardt, playwright; Jacole Kitchen, director; Sean Fanning, scenic designer; Michelle Hunt Souza, scenic designer; Melanie Chen-Cole, sound designer; Blake McCarty, video designer; Shirley Fishman, dramaturg; and Sebastian Perfetto, stage manager. The Playhouse is one of the few theatres in the country that annually commissions world-class artists to create a bold new play for young audiences. Playwrights create an innovative, 45-minute piece that addresses issues in students’ lives. Last year’s POP Tour, Home of the Brave, was seen by nearly 20,000 young people, teachers and families.